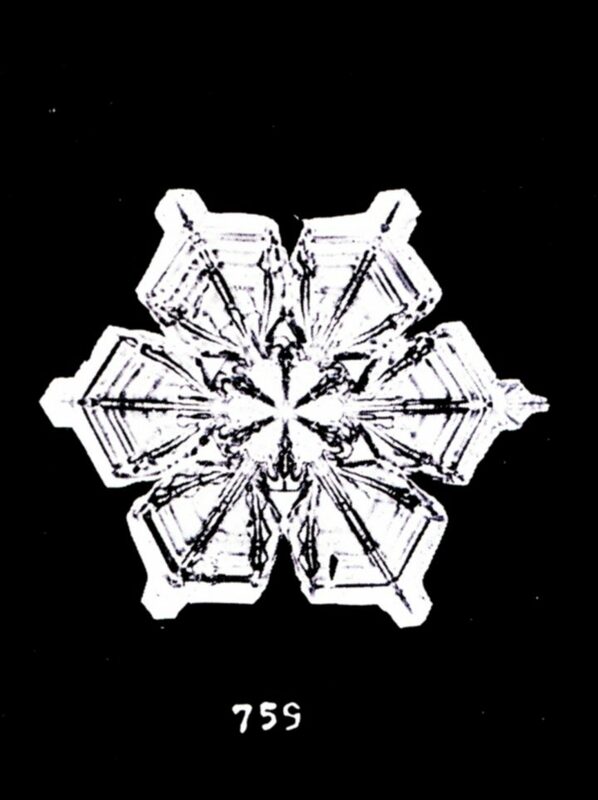 In 1885, Wilson Bentley, a farmer in Vermont, became the first known person to photograph a snowflake. He would document 5,000 of them in his lifetime. 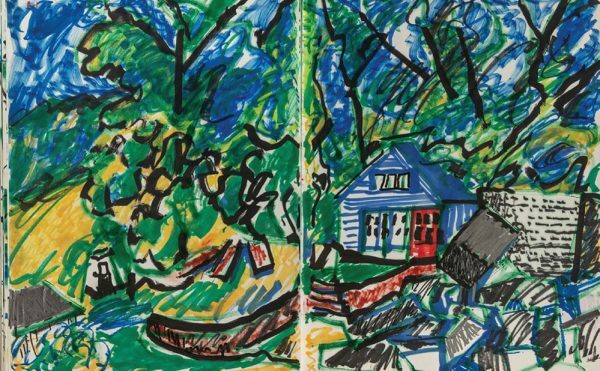 In a new series for the first day of each month, Hyperallergic is exploring some firsts in art, from the earliest known depictions of things to pioneers in the visual fields. 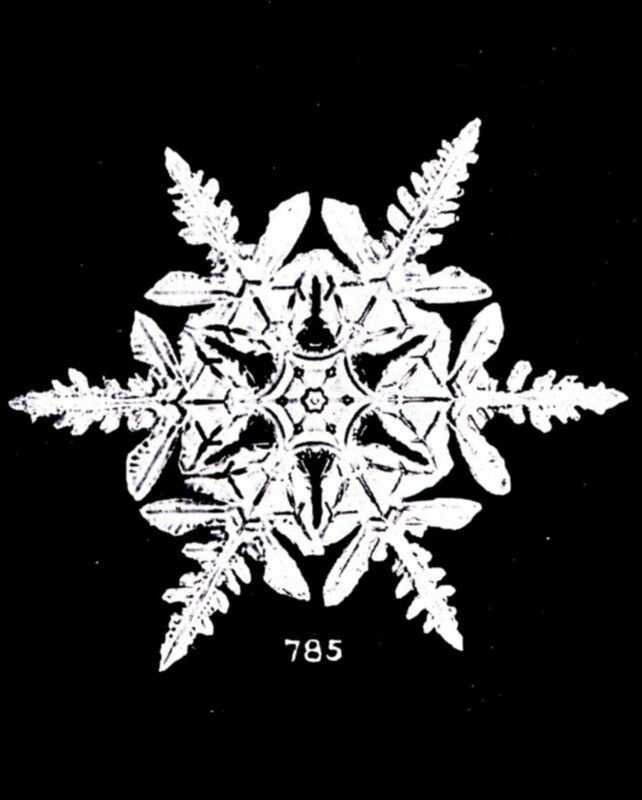 Winter is now settling over December, with flurries on brisk mornings and heavy snows that muffle the night. 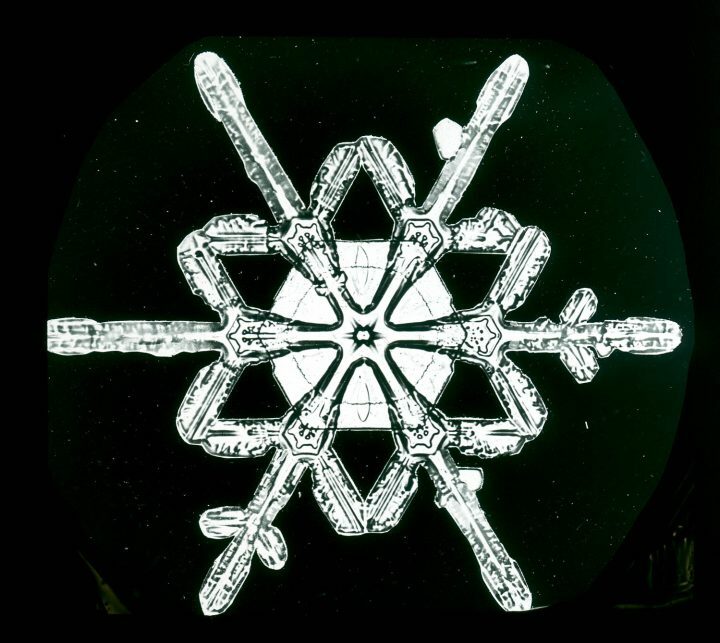 It was in this season of cold that Wilson Bentley, a farmer in Jericho, Vermont, attempted to capture the fleeting geometry of the snowflake with his DIY contraption of a microscope combined with a bellows camera. 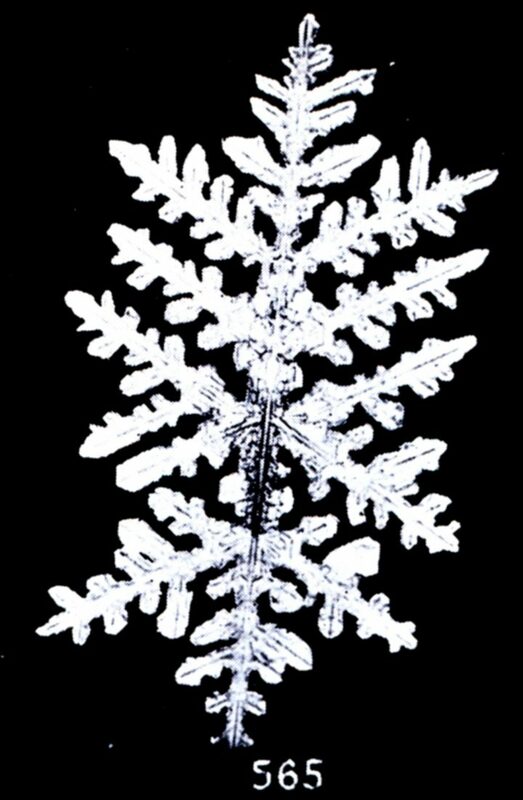 In 1885, at the age of 19, he became the first known person to photograph a snowflake, but it was hardly his last. 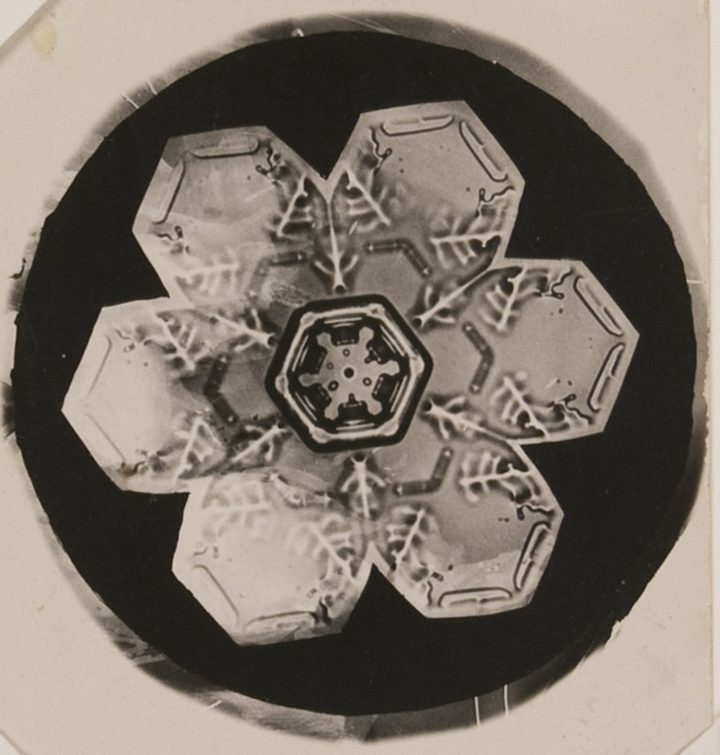 Working until his death in 1931, Bentley photographed more than 5,000 snowflakes. Quick, the first flakes are coming; the couriers of the coming snow storm. 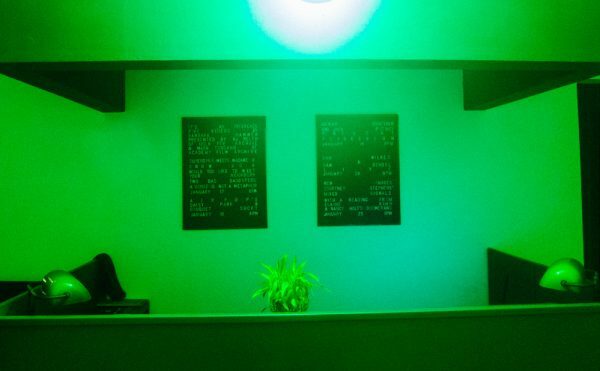 Open the skylight, and directly under it place the carefully prepared blackboard, on whose ebony surface the most minute form of frozen beauty may be welcome from cloud-land. 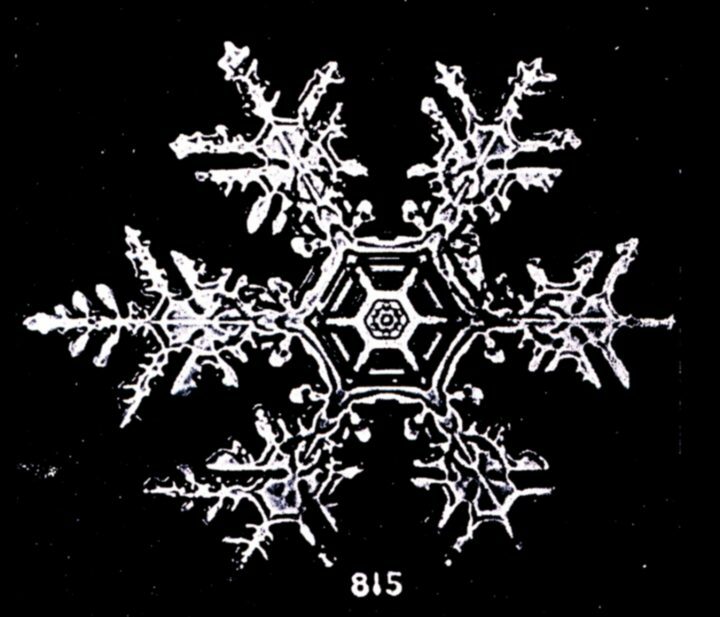 The mysteries of the upper air are about to reveal themselves, if our hands are deft and our eyes quick enough. 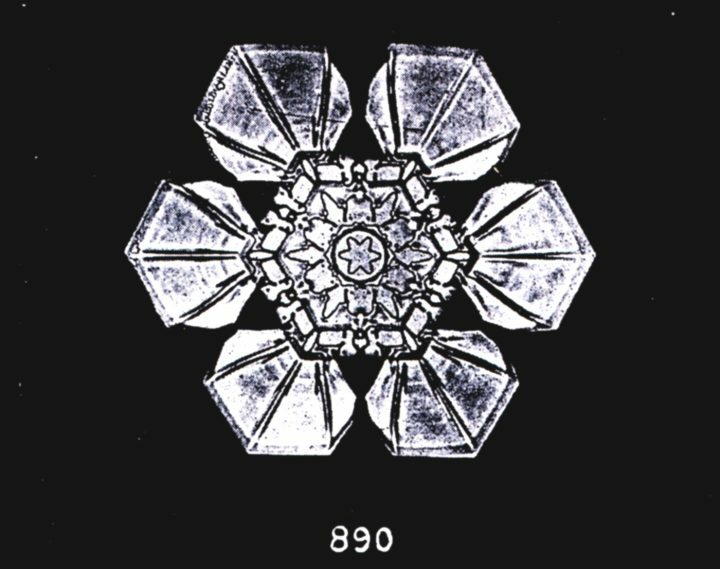 Bentley was not a trained scientist, or photographer for that matter, but when his parents gave him a microscope at the age of 15, he was hooked on examining the natural forces of the world. 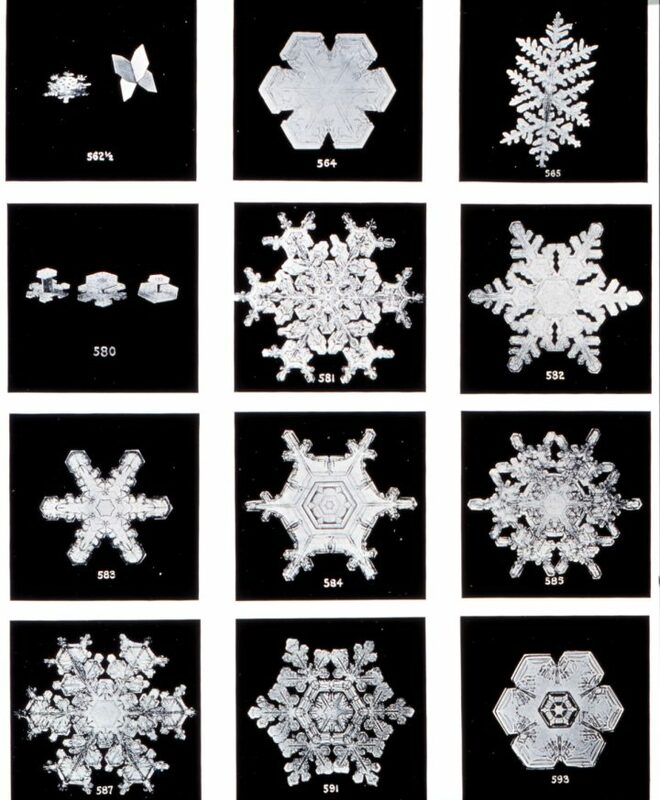 He would also study clouds and frost, yet nothing captured the public imagination like the snowflake photographs. 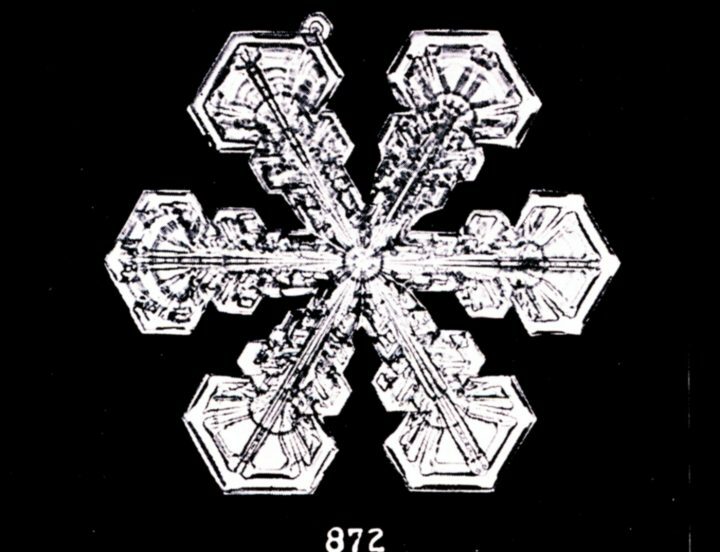 Today his work is appreciated as much as an artistic archive as a meteorological one. 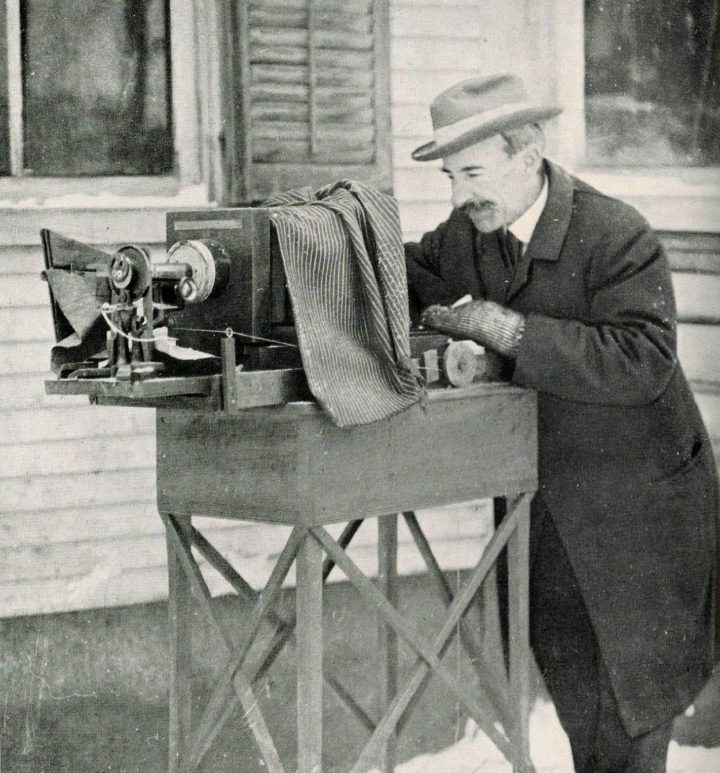 His photographs were recently featured in The Keeper at the New Museum, and his bellows camera and photographs are preserved in an ongoing Snowflake Bentley exhibition at the Jericho Historical Society. 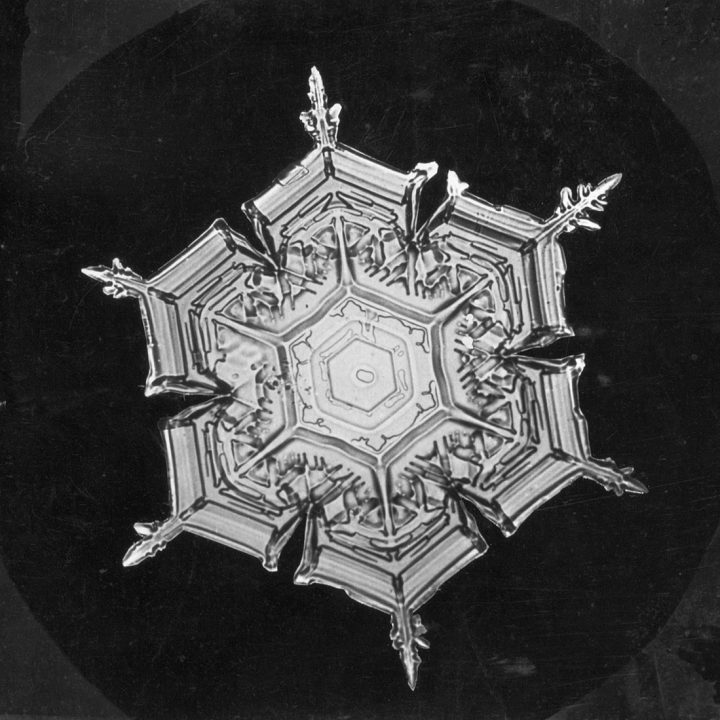 His glass-plate photomicrographs were donated to the Buffalo Museum of Science, which has digitized the collection online. Even altered by the hand of Bentley, these images represent beautiful ghosts from a winter that bristled the air over a century ago. As it happens, it was in one of those harsh storms that Bentley was overtaken by the weather he so loved. 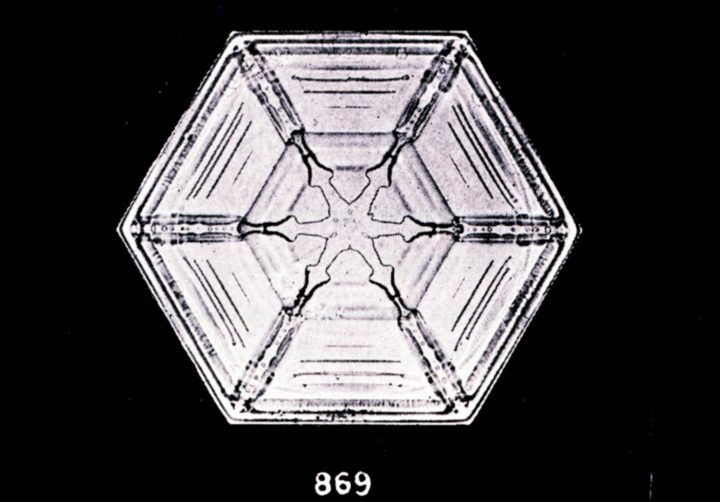 After walking six miles home through a blizzard in 1931, the same year his exhaustive Snow Crystals monograph was published, he died of pneumonia on December 23, on the farm, the snow stacking up around him. 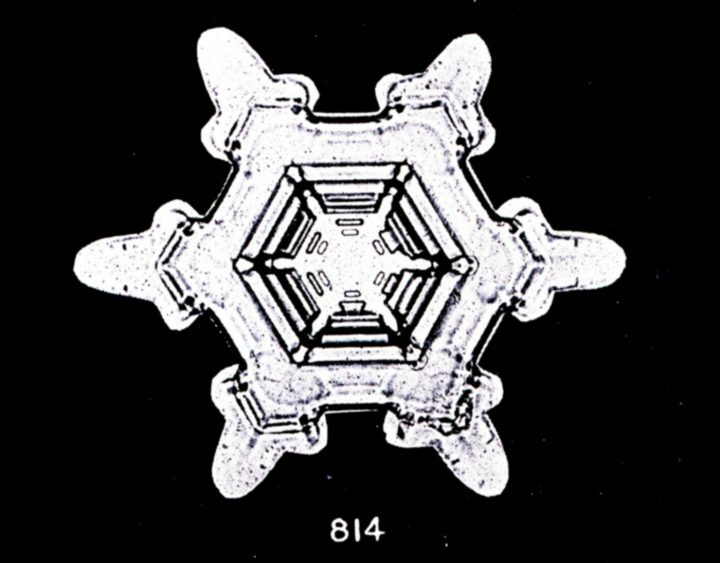 The Geometric Perfection of Snowflakes Preserving the Stories Behind Painstakingly Compiled Collections Are We All Unique Snowflakes?